The Movember Foundation, the only global charity solely focused on men’s health, is driving home the scale of the global men’s health crisis by asking everyone to take a moment to consider what life would be like without the men they love. What key moments would these men miss? Who would they leave behind? For the men themselves, what would they miss the most? 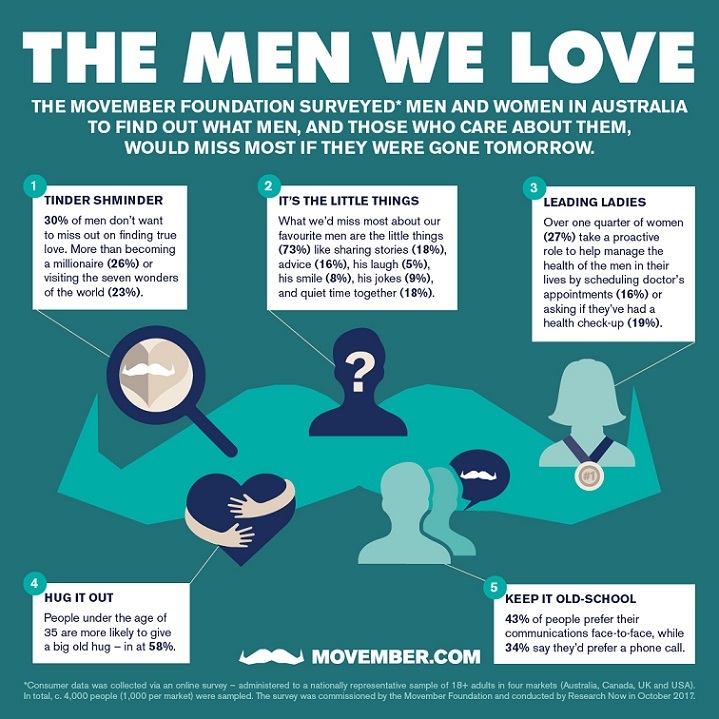 It was ‘the little things’ that prevailed when men across Australia, Canada, the United Kingdom and the United States were asked ‘what they would miss most’ if they were no longer around, according to research* released by the Movember Foundation. The little things were what 75% of men’s loved ones would miss most about them if they were gone tomorrow – including his stories (18%) and his advice (16%) to his smile (8%) and his laugh (5%) to his jokes (9%) and quiet time together (18%). Movember Development Manager, Kieran Ryan, who grew up in regional Victoria, said it was the little things that he missed the most when he lost two friends during his early 20s, after they took their own lives following ongoing mental health battles. ‘True love’ and ‘personal relationships’ were also a common theme that men would miss. After friends and family (84%), a third (33%) of men surveyed confirmed they don’t want to miss out on true love – even more so than becoming a millionaire (24%) or visiting the Seven Wonders of the World (24%). Furthermore, the data revealed that although we live in a digital age, texting isn’t enough because old school communication still means the most when keeping in touch with loved ones. Across markets, two in five people surveyed (43%) say ‘in person’ communication means the most, followed by a third (34%) who say a ‘phone call’ is the most meaningful. When it comes to keeping tabs on the well-being of the men in their life, women check in the most – within the past week, almost three quarters (72%) of women surveyed have asked a man in their life how they are doing and over two thirds (68%) have given him a hug. And, while men are very aware of their own mortality when it comes to facts and figures – with almost three in five men (58%) believing the statement that men die on average six years earlier than women – over one fourth (27%) of women take a more proactive role in managing the health of the men they care about (e.g. asking if they had a check-up lately (18%) or schedule a doctor or dentist appointment for them (17%). 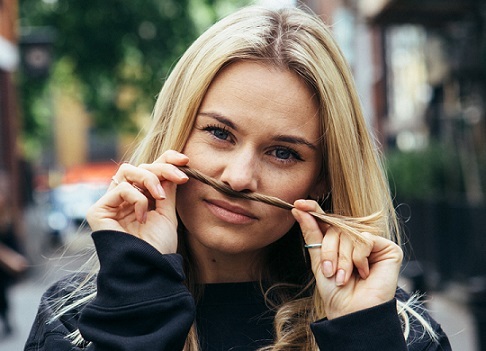 Here’s how you can help: Simply sign up at Movember.com and fundraise by Growing a moustache, making your Move and getting active for men’s health, Hosting an event or making a donation. *Consumer data was collected via an online survey administered to a nationally representative sample of 18+ adults in 4 markets (Australia, Canada, UK and USA). In total, c.4,000 people (1,000 per market) were sampled. The survey was commissioned by the Movember Foundation and conducted by Research Now in Oct 2017.